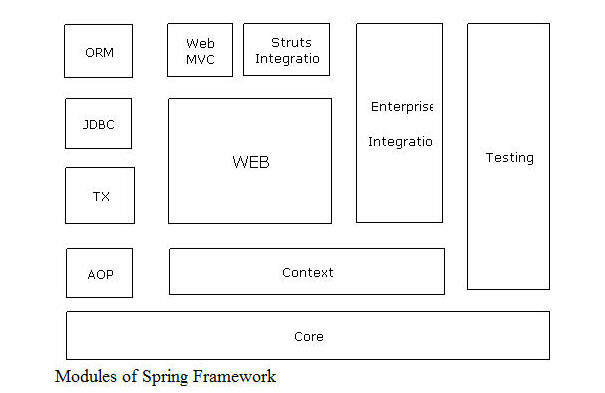 Introduction :The Spring Framework is a lightweight open source application framework that provide facility to develop enterprise application in java platform. Spring is an application framework i.e based on two concept first one is IOC (Inversion of Control ) and second one is AOP (Aspect Oriented Programming ). This framework does not confined it self to any specific domain or API. It can be used a console application , web application , enterprise application etc. It mean that this is a general purpose framework. Overview :The Spring Framework is a general purpose framework that provide following modules. Core: This modules provide basic implementation of IOC container. It provide Dependency injection, Object creation and Lifecycle management .The important basic concept is factory method to control the object creation by the IOC container and application developer using singleton or prototype model. AOP (Aspect Oriented Programming ): This modules build over the core and provide the concept of cross-cutting concern. The cross-cutting concern first one is concern , the concern is a task that perform as part of an operation and second one is cross-cutting, the cross-cutting is a set of concern that participate multiple operation. Context: This modules build over the core and represent the advance implementation of IOC container. TX (Transaction Management): This modules build over the AOP and provide facility to manage transaction in spring. JDBC: This modules build over the TX modules and provide template implementation of JDBC. ORM (Object Relation Mapping): This modules build over the JDBC that provide the facility of integration spring application to ORM framework such as Hibernate , Toplink etc. Web: This module is build over context provide automation of common operation of web application such as transfer of request ,data to domain object ,file uploading ,tiles convention etc. Web MVC: This module build over the web and provide an MVC implementation of spring for developing web application. Struts Integration:This module build over the web and provide facility to integrate spring application to struts. Enterprise Integration: This module provide facility of integration enterprise services such as JNDI, JMS, Java Mail, Web Services etc. to Spring application. Testing: This module over the core and provide the facility of unit an integration of testing. Inversion of Control (IOC): The inversion of control (IOC) provide the facility to creation of object, dependency satisfaction and lifecycle management. Aspect Oriented Programming (AOP): The Aspect Oriented Programming (AOP) provide the concept of cross-cutting concern. The cross-cutting concern first one is concern, the concern is a task that perform as part of an operation and second one is cross-cutting, the cross-cutting is a set of concern that participate multiple operation.